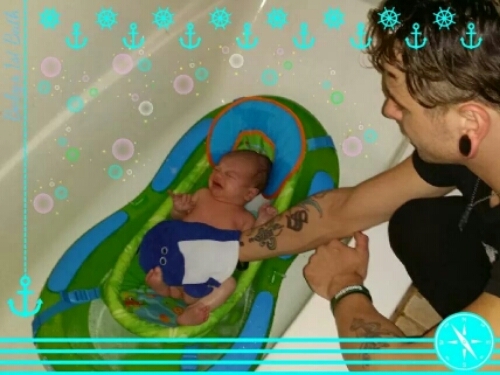 Acelyn’s umbilical cord fell off so he was able to have his first real bath! I’ll admit I had not the first clue on how to bathe a baby (even after reading my baby books) but fortunately his Dad did, as he has an awesome 5 year old. After the little one’s bath he had a fresh onesie ready and Nighttime Lavender Lotion. Such a snuggly guy already and even more so after his bath! This entry was posted in Fourth Trimester, Newborn, Pregnancy Journal. Bookmark the permalink.